"I definitely can give the Shadow Lounge credit for being a catalyst for the change that you see in East Liberty." featuring Formula 412, Phat Man Dee, Mega Def, Jasiri X, many more. $20 for each show or $30 for both. In recent years, there's been no shortage of media hype touting Pittsburgh as a haven for artists and young people. But back in the '90s, when Justin Strong was just starting at the University of Pittsburgh, the city didn't seem quite so attractive. "When I graduated from Allderdice [High School] in '96, the majority of my friends left," Strong remembers. "They went to Atlanta, D.C. and New York." But while his friends were going off to bigger cities, Strong was beginning to envision the idea of Shadow Lounge, the East Liberty venue that opened in 2000 and would become legendary for its role in Pittsburgh hip hop and art in general. The idea first took root in a crappy South Oakland apartment. "My house growing up was always the place where everybody gathered," says Strong. "So it's kind of like you're a product of your environment." When Strong went to Pitt, he recalls, he and his roommates "were just throwing parties. The first one we did was our sophomore year, in our apartment in Oakland." Strong always wanted to make sure there was something to do — and in the process, he involved friends who would become important parts of the Pittsburgh music scene. But just as that scene is gaining new traction, Shadow Lounge itself is closing. A combination of factors — business disagreements, the headaches of owning a liquor license, the pressures of neighborhood development — have led Strong to shutter the club. It will close this weekend, with a pair of send-off shows that will feature many of the artists who've called the venue home. "It definitely was a learning experience for the last 13 years," says Strong. "I'm just glad I started when I was 21 ... at least one of my knees is still good," he adds with a laugh. Not that anyone should count Strong out in the future. The adjoining AVA dance club will remain open, and Strong plans to open a new Shadow space elsewhere, though not immediately. "That place took a good 10 to 12 years to build up what it's built up," says Akil Esoon, a regular Shadow Lounge performer. "I think Justin himself is a brilliant businessman, and I think that his team [knows] what they're doing. They've been doing this long enough to know that all they need to do is get another venue, and once that happens, I think they'll pick up right where we left off — probably even better because the talent in this city is evolving." "I remember all the way back to 1998 when Justin would hold parties at his house," says Emmai Alaquiva. "‘The 305 Spot,' he ended up calling it," because of its location at 305 Meyran Ave. Alaquiva, owner of YaMomzHouse Recording Studio, located above Shadow Lounge, was Strong's first doorman when Shadow opened in East Liberty. He's since become a well-known producer, directing videos for Questlove's company Okayplayer, and winning a regional Emmy award for his work on a WQED documentary. "Working for Justin always felt like working with Justin," Alaquiva says. "That did a lot for my self-esteem and that did a lot for me wanting to go out after my dream." Nate Mitchell, known as Nate da Phat Barber — he's both a DJ and a barber, in addition to co-owning 720 Music, Clothing and Cafe in Lawrenceville — was involved with Strong's events back in the 305 Spot days. "I was putting together events with him," Mitchell says. "When the Shadow Lounge opened, it wasn't long after they first opened the doors that I hosted my first event. Now I've had, I don't know, 30 or 40 or 50 events at the Shadow Lounge over the years." "I definitely can give the Shadow Lounge credit for being a catalyst for the change that you see in East Liberty," Alaquiva adds. "When the Shadow Lounge opened, those of us who had been in and around East Liberty for the past 20 years knew what it was." What it was, Mitchell explains, was largely abandoned, thanks to a combination of 1960s urban renewal and suburban flight: "Anything inside [Penn Circle] just started to die." But once Shadow opened in 2000, other businesses began appearing nearby. "All of the businesses were vacant at the time; there was nothing but I think a Bell Telephone," recalls Brian Brick, owner of Timebomb Shop, a hip-hop clothing store that moved a few blocks from the lounge soon after its opening. Strong "envisioned what he wanted to do — without a liquor license, without food," says Brick. "It was really the first revival of the art community as a whole." A lot of artists — Kellee Maize, for one — were transformed just by spending time at Shadow Lounge. Maize's history with Strong dates back to an acting class they took at the University of Pittsburgh. She's since developed into one of the city's best-known MCs, although she was admits having been shy when she first began performing. Photo courtesy of William Feagins Jr.
"My first performance ever was at the Shadow Lounge," says Maize, a former City Paper employee. "When I went there, it was so comfortable and I could just be myself. So I would say it changed me in that it created a community for me to grow as an artist." Maize also runs Nakturnal, an event-promotion and media company, with partner Leigh Yock; she says Shadow inspired that effort as well. In addition to a variety of local and national events that were booked at Shadow, the venue consistently hosted open-mic nights that welcomed both aspiring and veteran artists to collaborate and hone their skills. 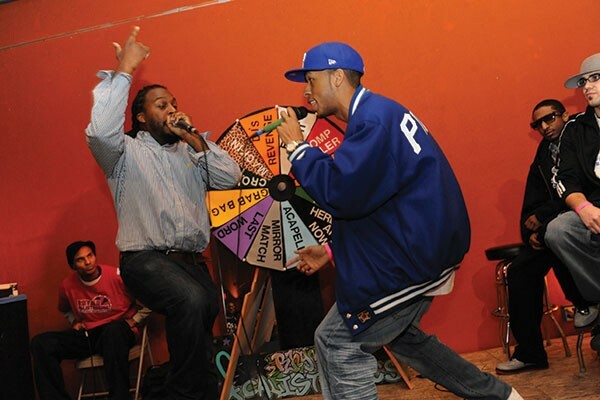 "The Shadow Lounge has a reputation of being a venue of talent development," explains James Armstead Brown, keyboardist for the venue's weekly open-mic series and co-founder of the Rhyme Calisthenics MC Competition. The latter event introduced popular local rappers Mac Miller and Real Deal, among others. "There's always been an open mic, ever since the Shadow Lounge opened — hip-hop open mics, acoustic open mics, poetry slams. It's like a talent-development factory." "It was such a nexus of different types of people," adds Brown, "that it allowed people who might not normally see hip hop to see the real talent level of the MCs that were competing. I think that's why it helped launch careers for Mac Miller and other folks — because it's a wide network of people." 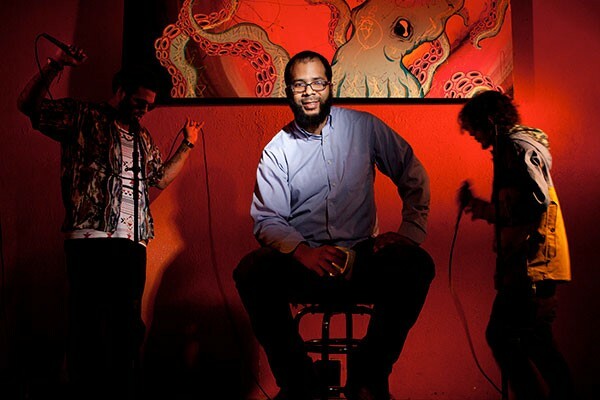 "The Shadow Lounge is one of the few places on the planet where you can go and express ideas and have fun and be a pure artist around other genius-level artists as well," agrees Akil Esoon, who has performed at the Shadow Lounge as a member of bands Akil Esoon Quintet, Beam and Formula 412. For Tim Guthrie, known as SMI, the journey has been both rewarding and aggravating. Guthrie first came into the Shadow Lounge as a DJ in 2002, and bought in as a co-owner in 2004. Shadow acquired a liquor license after Guthrie's buy-in, and added the adjoining AVA Lounge and the Blue Room. Guthrie was just back from living in Washington, D.C., when he got involved at Shadow. "Having someone that lived in multiple cities and who could bring those experiences to the table definitely helped," says Strong. "Our idea is that we want to have good art, good music and good people around — and not do Top 40," says Guthrie, who's performed as a rapper with groups such as Eviction Notice and as a DJ at several of the monthly Classic Material hip-hop parties. But Guthrie and Strong's relationship began to sour in 2008. Disagreements ranged over a variety of issues: managerial decisions, disagreements over whether to install a kitchen for day-time business, show bookings and more. And while still a part-owner, Guthrie moved to California last year — an attempt, he acknowledges, to distance himself from rising frustrations. "I'm always gonna have memories, like DJing for KRS-One," says Guthrie. But the distractions were mounting. "It's not just that you have two owners that need to yin and yang, bounce off each other. You need to make sure the train is running and still going strong." 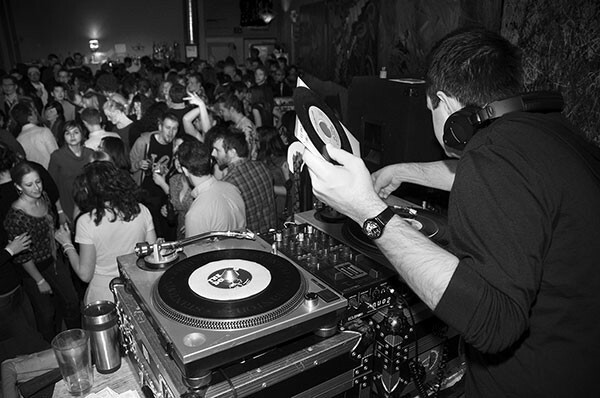 Focused on the music: Gordy Greenawalt spins soul at Shadow Lounge. "Eventually, you have to start making business decisions. It can't be party-time all the time," says Strong. "Over the years, it seemed like every so often we were instituting a new policy that was taking away from the original kind of Pee-Wee's Playhouse feel of the Lounge. That said, with any type or form of growth, you're gonna have that, especially with the responsibility of a liquor license." "It's a two-man operation, and most of the time it was myself putting in the hours," Strong adds. "So that kind of takes its toll. But we always appreciate the music-mind that [Guthrie] brought in as a great artist and DJ. It was just unfortunate on the business end that it didn't pan out." There were also concerns that as East Liberty attracted more interest from developers, the very revitalization that Shadow presaged was creating a more hostile climate. Last summer, there were concerns about anonymous zoning complaints — first reported in City Paper — which many club supporters attributed to upscale development nearby. Some regulars say they detect an increased undercover police presence at events. "I really don't appreciate all of the politics and weirdness that's going on now," says a regular Shadow Lounge MC and musician who goes by the name Free. 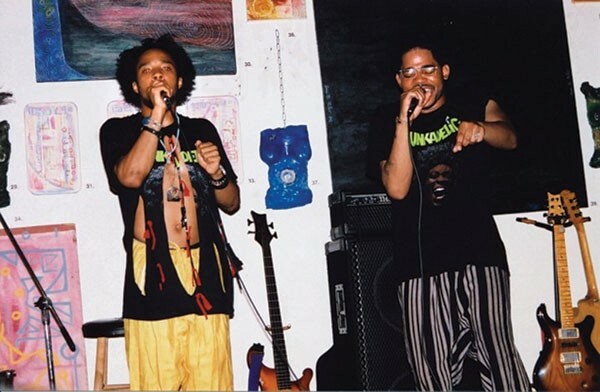 "I don't feel that a lot of these places would be here if it weren't for the Lounge," says Free, who fronts a band called Mega Def, formed from the camaraderie of Shadow artists. "Or maybe it would've taken them a lot longer. It says a lot that it has been there for this long." But taken together, there were too many obstacles to sustaining the club in its current form, Strong says. Shadow Lounge, LLC — the company run by Strong and Guthrie — is being dissolved. Strong says AVA and the future Shadow location will fall under the umbrella of 7th Movement LLC, which is headed up solely by Strong, and which is taking on the debt accrued by Shadow Lounge. As Strong puts it, "The financial summary of the Lounge has been a ‘dollar short and a day late' scenario most of the time." Still, the pending closure hasn't overshadowed the club's legacy. "Most venues don't have that long a lifespan," says Free. "They open and close and change names. I don't feel that Shadow Lounge necessarily gets the credit it deserves for its longevity, for what it has done and contributed." "There was some discussion about, you know, two white kids playing funk and soul music in East Liberty," Greenawalt says with a laugh. "But at the end of the day, I honestly didn't think about any of that. It was really so focused on the music that racial implications didn't even come to mind." "What Justin did was play a major role in bringing new people to the neighborhood," adds Greenawalt. "He created a space for people to come together, and I think that's one of the big things that he played a part in." And Brick, of Timebomb, has faith that Strong will continue to do so. "Every day, I say [Justin] should just [run for] city council; he probably could get elected. There are people in this community that you can trust; he's one of those guys. He treats everyone fair, and that's why I think everyone respects the Lounge."